Elmalı (literally apple-town) is a district as well as the its center town in Turkey's Antalya Province. It lies about 35 km inland, at the head of a long upland valley at an altitude that varies between 1050 to 1150 meters from sea level for Elmalı urban center. Aside from the town of Elmalı, the district includes two depending townships with own municipalities (Akçay and Yuva) as well as villages. In 2000, the population for the whole district was 40,041 and 14,600 for the district center. 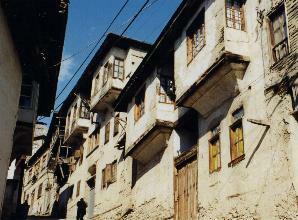 The district's economy is largely agricultural, although some touristic interest is rising thanks to its rich traditional architectural tissue. In keeping with its name, Elmalı represents about one tenth of the total apple production of Turkey. Its leblebi is also delicious. The district is inhabited by direct descendants of the ancient Lycians, who have preserved a distinctive facial type, noticeable at once in the town population. There were about fifty Greek families, the rest of the population (4000) being Moslem (as of 1911). The district is agricultural. Elmalı Treasures (Elmalı Hazinesi) is the name commonly given in Turkey to 1,900 pieces of silver coin (including 1,100 Lydian coins and 14 extremely rare decadrachms) dating from the period of the Delian League that were discovered during an illegal excavation in 1984 in Bayındır village near Elmalı and smuggled to the U.S. Their retrieval from the Boston Museum of Fine Arts through the efforts of the journalist Özgen Acar and of the Turkish government had made the headlines in late 1990s for a long time. Today, they are on exhibit in Elmalı Museum. Elmalılı Hamdi Yazır, an early 20th century cleric, whose Turkish translation of the Koran is accepted as a reference, is from Elmalı (although his family descended from Yazır Turkmens of Burdur).